We accept all kinds of groups except loud ones. Hostel Malti is situated in a quiet neighbourhood, so we ask guests to enjoy their stay whilst respecting the neighbours. BBQs, Sun deck, Jacuzzi and a Comfy Chillout area... are some of the simple pleasures our guests can use freely at Hostel Malti!! Enjoy sunsets from our Roof Top Terrace for our scruffy and happy guests... a terrace not to be expected in most Hostels! Our terrace has always been the perfect place for travelers to relax after spending their day exploring the beautiful island, where they can sit back and share travel stories, or enjoy cocktails in our Jacuzzi. We host frequent roof top BBQ's which can be enjoyed whilst winding down and listening to some summer chillout tunes. We will go out of our way so to help you find an activity, interest or adventure that excites you, whether it is beaching, cliff jumping, partying, hiking, scuba diving, learning English, 4WD, biking, sailing, shopping/market places, horseback riding, or snorkeling!! We organise hostel trips to Blue Lagoon, Gozo and Valletta/Mdina during the summer months, where guests are shown the islands most beautiful and secret places by our experienced tour guide. The trips include speed boat rides, cliff jumping, snorkeling in crystal clear waters and making lifelong friends with your fellow hostel travelers. One of our many great achievements is bringing people from different nations together! With the help of the atmosphere created on our rooftop terrace and the warm homely feel in the Hostel, we welcome you to be part of the good vibe that resonates here. We have a strict rule that after 11:00pm is quiet time, even though most guests are warming up for the night at that hour. So to continue the fun, on most nights we organize a small pub crawl to kick off the evening, these are fun and good value for money. In order for you to have a nice lie-in in the morning we have equipped the rooms with black-out curtains. Whilst for our early birds, the fully equipped outdoor kitchen is very popular whether it's for a quick fry up or a healthy fruit salad. I absolutely had an amazing time at this hostel! It really feels like home, the communial area is great to meet like minded guests. So many great facilities too, the roof terrace has a great view and they also have a hot tub!! Though the person that makes this place so great is Eszter she is fantastic, can answer all of your questions, and makes you feel so welcome. She goes above and beyond and goes out of her way to help you. Knows all the best places in Malta. PS: The pub crawl is a must!!! Absolutely amazing! Very chill, clean, and overall great atmosphere. The staff was extremely helpful and nice. Would recommend !! 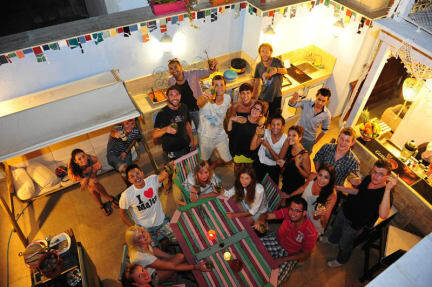 Hostel Malti offered a great home base for traveling throughout Malta. The atmosphere was very homey and welcoming, and everyone was very warm and friendly especially Eszter. She was extremely helpful and provided great advice. It was obvious how much she truly cared about the guests and went above and beyond to make sure each person had a great experience. I absolutely love this place! It really feels like home which is so nice when you've been traveling for a while. Eszter is fantastic, can answer all of your questions, and makes you feel so welcome as soon as you walk in the door! 12/10 would recommend! Really friendly vibe and helpful staff, would recommend this hostel - worth it for the roof terrace alone! Funky hostel with comfy beds, roomy showers, spacious lockers, a nice rooftop area & spa. 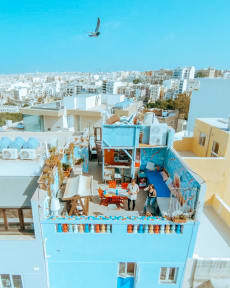 Located close to all the dance and strip clubs - perfect location for young people... but there are nicer areas to stay/visit in other parts of Malta if that's not what you're looking for. Those places are easy to walk or catch the bus to from this hostel anyway. Bring your own padlock and UK adapter if you don't want to pay (1 euro) for one. Helpful staff, thanks! Definitely good value for money here. Esther is the best and was the best part of this hostel!! Additionally, a man who's name I did not catch who also works at the Peter Pan hostel went above and beyond for us. It's a bit strange that there are no locks on the individual doors, but there are spaces to lock all of your luggage so we never felt like we were unsafe. The location is a little bit of a hike from the city center, but you don't need a car to get around! Overall, would highly recommend this hostel. Super comfy beds too! A great little hostel! Fulfilled my needs for this short break. beds were comfy and clean, would always see tino (cleaner) hard at work and with a smile on his face. traveled alone but atmosphere was great, really good setup to meet other like minded travelers. honestly my whole experience was lovely due to the receptionist, Eszter. she went above and beyond to make sure everybody was happy, well accommodated, and having fun while traveling. to have such welcoming arms upon arrival really makes you feel special. would definitely stay here again! !